My eighth stadium of 2014 was on Monday 21st April at Victoria Park in Hartlepool, County Durham. 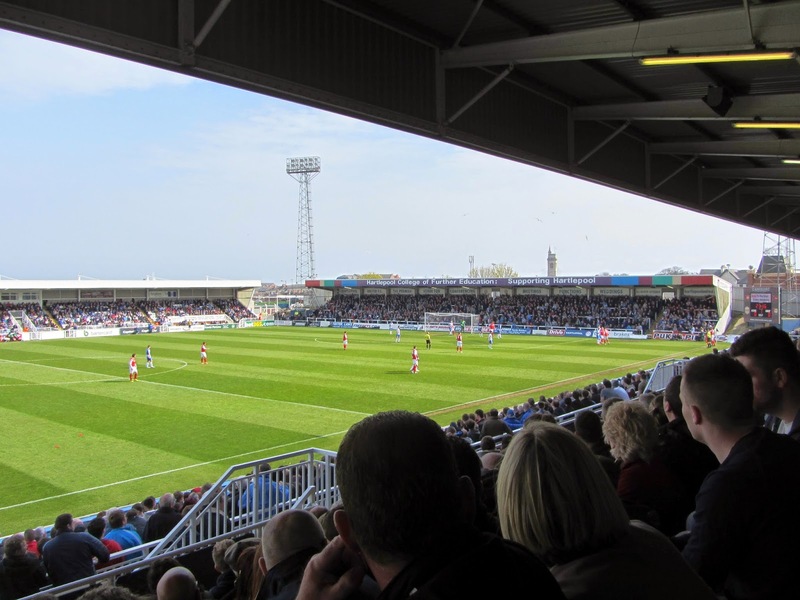 The match was Hartlepool United vs. Morecambe in Football League Two. Victoria Park is in a convenient location on the edge of a large retail park close to the town centre. It is also within a short distance of the town's Marina and railway station. The ground was originally built for the town's rugby club in 1886 and has been home to the football team since it formed in 1908. The Cyril Knowles Stand on the east side of the ground was opened in 1995 and is the most modern structure in the venue. The all-seater stand has 1,600 seats and a row of hospitality boxes along the back of it. The stand attaches to the main club building featuring the reception and ticket office. The opposite side sees a mixture of terracing and seating. The area closest to the pitch is given to uncovered concrete terracing with room for just over 1,800 fans. Directly behind this is the Niramax Stand which is raised above the terrace to be the tallest stand in the ground. This was opened in the late 1960s and has 1,600 bucket seats built into the concrete. The area behind the goal at the northern end of the ground is the Rink End - a 1,000 seat stand given over to away fans. This stand has a few supporting pillars so is the only one in the ground which has restricted views. At the other end of the pitch is the only side consisting entirely of terracing - the Town End. 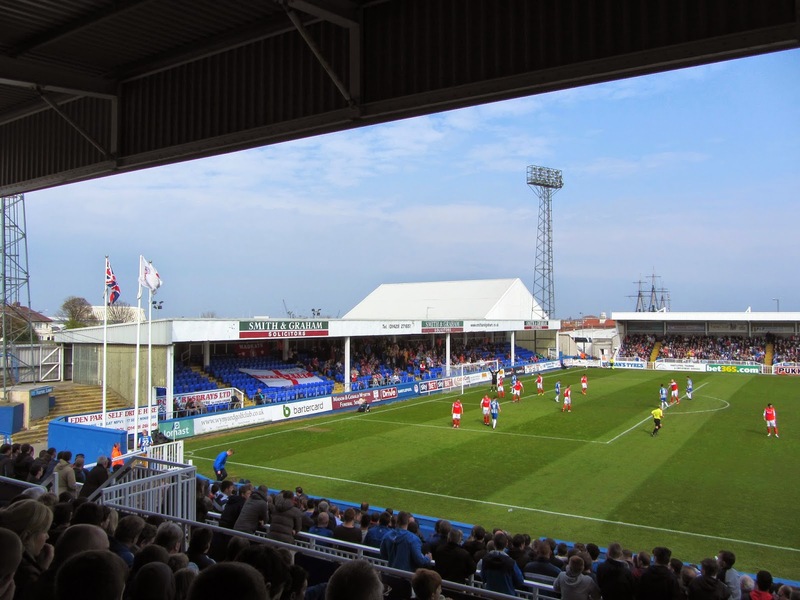 This stand can hold just under 1,800 supporters with the most vocal Hartlepool fans tending to congregate in this part of the ground. With an overall capacity of under 8,000 Victoria Park is a compact venue with an old ground feel - the short stands with low roofs make sure the acoustics are very good making for an excellent atmosphere. 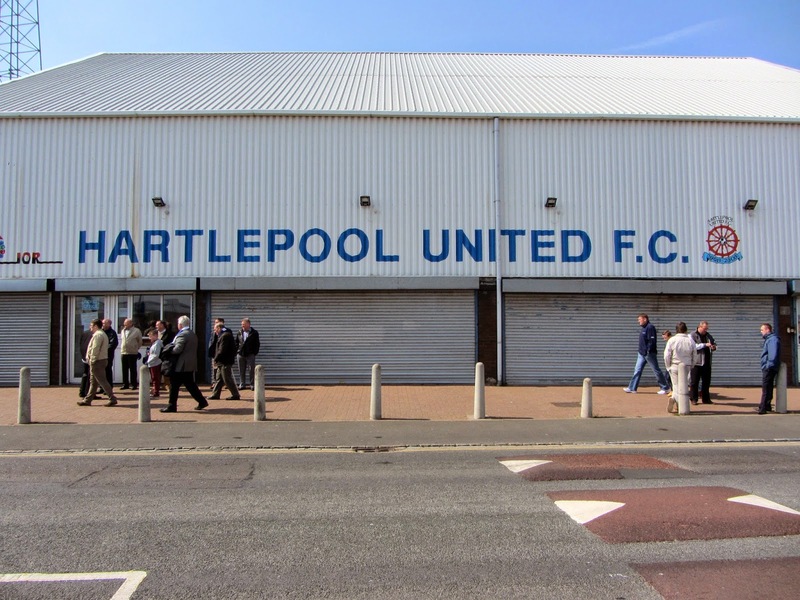 Hartlepool came into the game on the back of a six game losing streak which had seen them slide down the table into a second consecutive relegation scrap. Morecambe were in a similar predicament having started the season well but an eight-game winless run had seen them fall near to the drop zone. Both sides knew that whoever won would basically be safe and that translated to a nervy first half with Hartlepool on top until the visitors netted against the run of play. It was the 25th minute when Andy Parrish lofted an optimistic ball into the box - Kevin Ellison was able to hold off his marker and nod the ball over defender and goalkeeper into the back of the net. That was how it stayed until half-time - Hartlepool came out fighting in the second half but things got worse for them in the 57th minute when Simon Walton was shown a straight red card for a high tackle on Jordan Mustoe. Interestingly despite being a man down Hartlepool seemed spurred on by this and dominated the rest of the game. They pushed Morecambe into defending very deep and in the 67th minute Jack Compton let fly with a 25 yard drive which dove into the bottom corner of the net. The hosts piled forward in search of a vital winner and in the 81st minute they got it. Jonathan Franks' long range effort was palmed as far as Jack Barmby who cooly sidestepped a challenge before slotting it past the goalkeeper to secure League Two survival for Hartlepool.